Alan Crisp talks to his infield during a Division IV district softball game on May 18, 2017, in Minford, Ohio. RACINE, Ohio — A familiar face to lead the Lady Tornadoes. At a recent meeting, the Southern Local School District Board of Education unanimously approved the hire of Alan Crisp as the varsity girls basketball coach. Crisp — who will enter his eighth consecutive season as Lady Tornadoes softball coach in the spring of 2019 — last coached the SHS varsity girls basketball team in the 2009-10 season, completing a four-year stint. 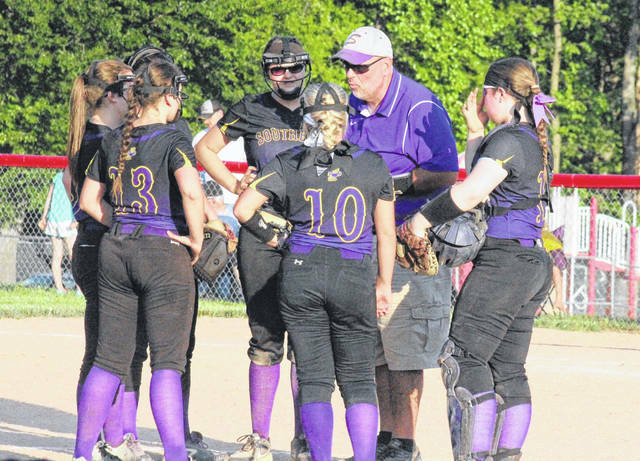 In his current tenure as SHS softball skipper, Crisp has led the Purple and Gold to a 118-85 record, with six sectional titles. Still, more than the on field success, Crisp noted that the connections made with players as a primary point of pride. “I just like being around the kids and the camaraderie that you develop with them,” Crisp said. “I think I’ve done that with softball a lot, developing positive relationships so that they’ll not only look at me as a coach, but they’ll call me for job recommendations or whatever they may need. I think that’s a big part of coaching, it’s not just X’s and O’s, but the relationships that you build with the players. In addition to the basketball players that Crisp has coached in softball, he also coached some of his juniors in junior high volleyball. Crisp — who will be the fourth head coach in six seasons for the Purple and Gold — is also looking to add a measure of stability to the Lady Tornado basketball program. Crisp is replacing David Kight, who coached the Lady Tornadoes to a 7-17 record in one season. Just five players can return from last season’s squad, however, as six of the team’s 11 players were lost to graduation. “We lost a lot of seniors last year, and we going to be really young, so it was good time for a new coach to come in,” said Crisp. “We don’t have any seniors right now that I know of, at least there were no juniors that played last year. It’s a good time to get everybody to jell together and start rebuilding. Prior to last season Southern had four straight winning campaigns, with the program’s only sectional title in the last decade coming in 2016. Crisp and the Lady Tornadoes will begin the 2018-19 season on the road, as they’re slated to visit Meigs on Nov. 26.